When I was a senior in high school I became very sick. My hair was falling out, I was unable to stay awake, my body temperature dropped drastically while I slept and even with pints of blood taken out, no one could tell me what was wrong with me. By chance my mother saw an article in a magazine highlighting a woman with similar symptoms as mine who had gotten better through the help of a Naturopathic doctor. I had nothing left to lose so I scheduled a consultation and hair analysis. My results came back and I had 400 times the normal amount of copper in my body. I detoxed with herbs and completely changed my diet and recovered over time. From that point on I decided I that I wanted to help other people who are suffering and have nowhere left to turn. 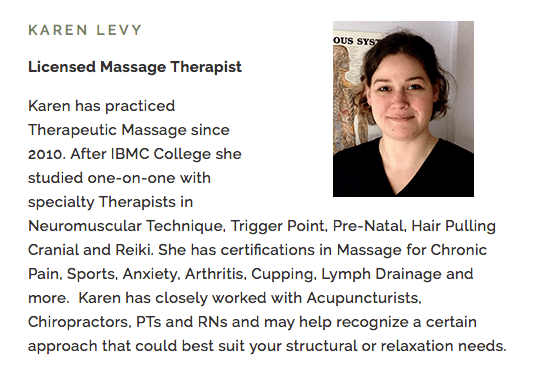 I have always had a passion for helping people, and finding out about holistic medicine and later on acupuncture and the amazing impact it can have on people’s lives gave me an avenue in which to accomplish my goals. Having been looked down upon for my style of dress, my tattoos and my piercings for a better part of my life, I want to provide a judgment-free space where anyone can come in and not be afraid to be themselves. I want to provide a platform for people to come and increase their quality of life while fostering the growth of both body and spirit as they pursue an individual path of healing. In my free time I enjoy gardening and going to local shows and breweries. I have a number of tattoos and piercings. I love taking my cats and bearded dragon out for walks in my garden. I am the oldest of six children. I am half Cuban and can speak some Spanish and understand it well. I also love kids and have worked as a nanny for many years as well as a supervisor in a pizza shop cooking up delicious pies! 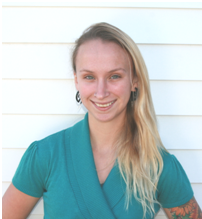 AcuPUNKture is lucky to be sharing space with a very gifted Licensed Massage Therapist. Please follow the link below to learn more about their services and book an appointment today. A shamanic energy healing works to clear blocks in your chakras (energy centers) and fills them with healing, positive energy. Throughout life we hold on to emotions/traumas/limiting beliefs and push them aside without acknowledging or releasing them. These traumas/emotions/limiting beliefs stay within our energy bodies and continue to present themselves until healed. They can resurface as a physical aliment, fatigue, despondency, or many other forms. A shamanic energy healing can aid in clearing blocks from childhood, the present, past lives, and blocks passed down through the lineage all while you lay down and relax. While healing I am in connection with mine and your spirit guides. I use my intuition and their guidance to feel and move through your energy. At times I may also receive messages or information from the Divine, Archangels, and/or ancestors. Each person is unique and ever changing, therefore, each healing will be unique to the person and their energy. If your energy is calling for it I may incorporate different tools (crystals, oils, reiki, etc) into a healing. This can be done in person or from a distance. Contact me and we can set up an appointment.